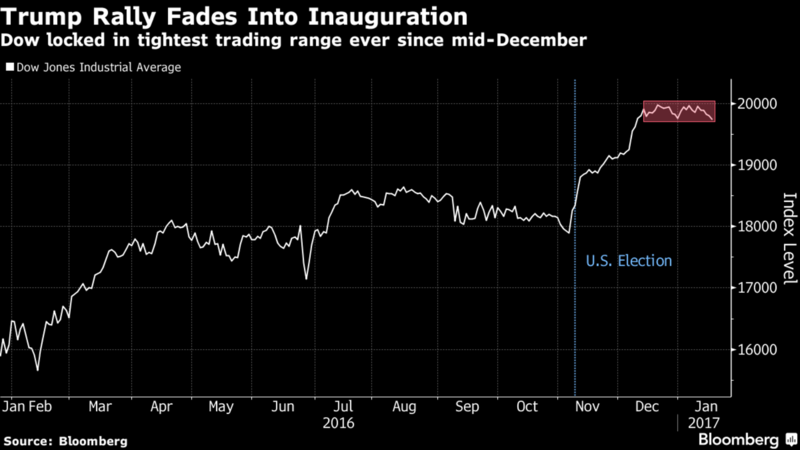 A new presidential era began last Friday with Donald Trump’s inauguration, and the market reaction was far more restrained than its response to his election. For weeks after the presidential election, we saw markets defy expectations and post significant gains. In fact, the Dow grew by over 1,500 points between November 8 and December 121http://fortune.com/2016/12/15/donald-trump-dow-20000-rally-not-huge/. In the four days of trading last week, major U.S. indexes continued the sideways performance we’ve seen since December. For the week, the S&P 500 was down 0.15%, the Dow lost 0.29%, and the NASDAQ gave back 0.34% 2http://finance.yahoo.com/quote/%5EGSPC/history?period1=1484283600&period2=1484888400&interval=1d&filter=history&frequency=1d http://finance.yahoo.com/quote/%5EDJI/history?period1=1484283600&period2=1484888400&interval=1d&filter=history&frequency=1d http://finance.yahoo.com/quote/%5EIXIC/history?period1=1484283600&period2=1484888400&interval=1d&filter=history&frequency=1d. International stocks in the MSCI EAFE also declined by 0.48%3https://www.msci.com/end-of-day-data-search. Despite these weekly losses, Friday’s market performance marked one milestone not seen since John F. Kennedy’s election: index gains on inauguration day4http://finance.yahoo.com/news/futures-rise-ahead-trumps-inauguration-125659673.html. Nonetheless, we still see a market that has been in a holding pattern for weeks. The S&P 500 has barely moved since the day before the Fed raised rates on December 145https://www.bloomberg.com/news/articles/2017-01-19/stocks-in-asia-signal-caution-ahead-of-china-data-markets-wrap. And if you analyze this graph of the Dow’s performance, you see a similar scenario. The index grew sharply after the election, but the red box shows performance stalling since December. The markets are incredibly complex and multifaceted, so one answer cannot fully explain their performance. However, after rallying in anticipation of Trump’s promises for lower taxes, decreased regulation, and increased government spending, investors are now waiting to see which policies will come to fruition6http://www.cnbc.com/2017/01/20/us-markets.html. No one knows for sure what policy changes or political developments lay ahead. We must look closely at fundamentals to see beyond the headlines and find a clearer view of where the U.S. economy stands today. During the current corporate earnings season, 63 companies have reported their fourth-quarter results so far. Of these companies, 63% beat earnings-per-share estimates and 46% exceeded their sales estimates7http://www.pacificglobal.us/wp-content/uploads/2017/01/Pacific-Global_WeeklyRecap_Jan20.17.pdf. Consider this: After former-President Barack Obama’s election in 2008, the S&P 500 dropped 15.5% by inauguration day, as his transition period coincided with the deepening financial crisis11http://finance.yahoo.com/news/futures-rise-ahead-trumps-inauguration-125659673.html. Investors who allowed emotions to take over at that point and left the markets could have missed the S&P 500’s 12% average annual growth each year Obama was in office12http://fortune.com/2017/01/20/thanksobama-heres-how-stocks-did-during-obamas-presidency/. Treat yourself with a dessert pudding served warm or cold! Grease a 9×5-inch loaf pan. Have a roasting pan on hand as well. Use a large bowl to mix eggs, milk, sugar, and vanilla until smooth. 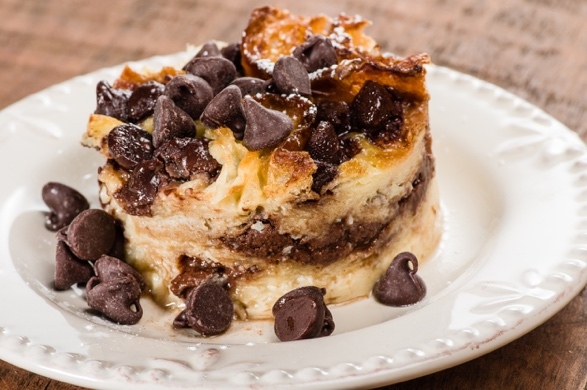 Stir in the bread cubes, bananas, and chocolate chips. Let the mixture sit for 5 minutes so the bread soaks. Pour soaked-bread mixture into the prepared loaf pan. Line roasting pan with a damp kitchen towel (not a paper towel). Place loaf pan on towel inside roasting pan. Fill roasting pan with water, reaching halfway up the sides of the loaf pan. Bake in oven for 1 hour or until an inserted knife comes out clean. Twitter: The IRS tweets tax tips in English and Spanish through different Twitter accounts. Follow these IRS handles: @IRSnews, @IRStaxpros and @IRSenEspanol. Follow the IRS Taxpayer Advocate Service at @YourVoiceAtIRS. Facebook: Whether you need help as a taxpayer or tax return preparer, you can keep up with the IRS Facebook accounts to find helpful tips. Follow @IRS for taxpayers, @IRSTaxPros for tax preparers, and @YourVoiceAtIRS for the Taxpayer Advocate Service. Tumblr: The IRS publishes a Tumblr blog that provides readers with the latest tax news, accessible from a smartphone, tablet, or computer. Follow them for updated information. YouTube: You can follow the IRS on their YouTube channel where they provide short videos on a variety of tax topics. You can view the videos in English, Spanish, and American Sign Language. The IRS only uses social media channels to share public information and will not answer personal tax or account questions. Remember to never post your Social Security number or any other personally identifying information on its social media sites. A good putting game is critical and can mean the difference between birdies and bogeys. However, many golfers struggle with improper alignment and compensate by cutting across the ball when coming through for contact. Unfortunately, the cut-across move does nothing but mess up your play—and you pay the price in extra strokes. This technique causes the ball to roll with sidespin, which makes sinking putts much harder. Good contact and accurate shots require a square putter face at impact. Lay down alignment sticks (or golf clubs) slightly wider than the width of your putter head and aimed at the hole around six feet away. To allow for an in-to-out stroke path, place the front end of the stick furthest away from you at the ball, and the back end of the stick closer to you at the ball with the front end pointing at the hole. Hit putts from this station without bumping into either alignment rod to groove an inside-to-straight stroke. Tip courtesy of Darren May | Golf Digest15http://www.golfdigest.com/story/the-putting-alignment-mistake-youre-making-and-how-to-fix-it. Wash your hands with soap and water both before and after handling any raw meat. Rinse all meat, poultry, fish, fruits, and vegetables under running water before cooking or serving them. Separate raw foods from any cooked foods; never let them cross-contaminate. Do not leave foods out on a counter, table, or other open space to defrost. Only defrost foods in the refrigerator or in the microwave. Wash all utensils and cutting boards used to prepare raw meat before reusing them. Cook foods thoroughly and test temperatures with a meat thermometer. Cook whole poultry to 180° F, roasts and steaks to 145° F, ground meats to 160° F, and fish until it is opaque. The household cleaners we buy on the market often have unrecognizable and abrasive chemicals in them. You can minimize the amount of chemicals you interact with in your daily cleaning routines—and also reduce your expenses—by making your own household cleaners. Most of the ingredients are usually from natural resources and items you already have in your house. Here’s one recipe for an all-purpose cleaner that is easy to make and can help support your green living. Combine ingredients into a bowl or glassware with lid for storing later. Pour solution on clean sponge or cloth.